Tired of receiving sales calls from mobile phone companies and what seems to be an endless pile of leaflets and brochures through your letter box? No matter what your age, job, or background, we’ve all come across some form of outbound marketing. Companies and organisations invest a huge amount of resources into generating leads in this way, and it’s really just a numbers game. Unfortunately, this is not the most cost effective way of generating leads or attracting attendees for event organisers. Lack of resources and investment can substantially hinder the outbound event marketing approach. “A SOLUTION” I hear you cry! “YES, let them come to you!” Another great aspect of inbound lead generation is cutting out the “don’t call us, we’ll call you”. 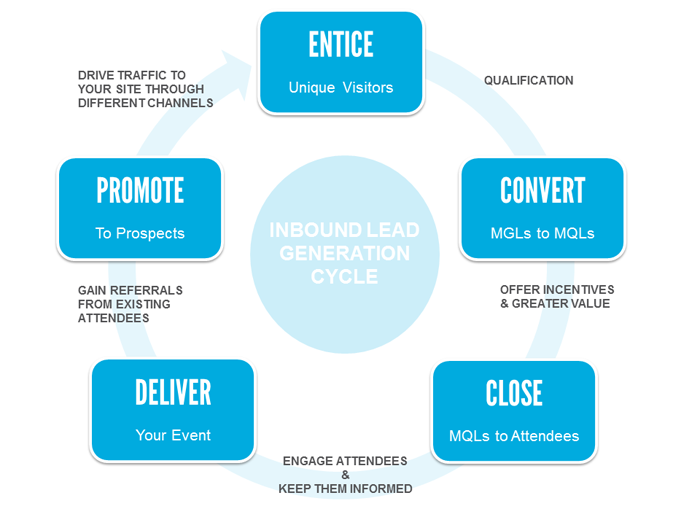 However for inbound campaigns to be successful you need to know your attendee inside-out. Download your copy of the Inbound Lead Calculator to help you throughout you lead generation cycle. This isn’t a CV and “qualification” does not require a degree! As you are relying heavily on your prospective attendees coming to you, you must ensure that you are using the correct messaging to address their needs in your marketing materials to entice and drive traffic to your event site or online registration page. It’s pretty simple, if you know what they want, you can sell to them! Once you have created a buzz around your event and driven traffic to your event site and registration page, it’s time to CLOSE, turn those MQLs into attendees! Including offers and incentives works extremely well in boosting event registrations. Unique visitors, MGLs, MQLs, monthly revenue; it’s vital that you produce a monthly forecast of your metrics to ensure that you are meeting your event marketing goals and objectives. 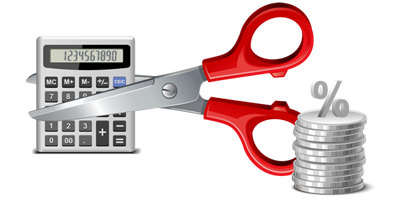 You can access and download a FREE Inbound Lead Calculator here to help you for your event. Engaging your attendees with fresh content that they find useful is a great way of keeping up the momentum or the buzz created through your marketing campaigns. Keep attendees interested in your event and encourage the sharing of event information and content, such as whitepapers, infographics, photographs, and video content, with their social groups and colleagues to help increasing your profile. Tip: It’s a good idea to track each of your marketing activities so that you know what works best and where to concentrate your marketing efforts. Read my post of “Event Tracking – The Professional’s Game of Tag” for some helpful hints and tips. Although we’re not in the school playground, in the game of event marketing (the professional edition), “tagging” is almost a daily ritual. UTM tags are identifiers that Google Analytics use to differentiate each of your marketing activities in order to track each campaign separately, and essentially help you identify which activity performs the best. ACHIEVING GREATER CONVERSION! Yes, you may have a manicured marketing plan in place, but it’s imperative that you TRACK, MEASURE, and REPORT on your event marketing success so that you can OPTIMISE your activities and increase your conversion rates. It’s amazing how a simple thing like colour can evoke different reactions and perceptions. The same rule applies to your event marketing campaigns, whether it’s messaging, image, or a call to action, it’s vital to assess what works the best. A/B testing is one of the ways that you can test two variants, (A and B), to identify alterations made to a web page that can have an effect on your metrics, such as click-through-rates, downloads, or contact requests. What if I want C? For those who want it all, bucket testing or multivariate testing enables you to experiment with more than two versions of a web page or email campaign simultaneously. There are many tools that enable you to track your marketing activities in order to optimise them to boost your event conversion and increase your ROI. Remember, optimisation is not a one night affair; it’s a continuous process and as such all results should be recorded using a Report Template. Technology has changed the way we market our events, paving the way for greater control and accuracy in tracking, measuring and reporting on the success of event marketing activities. 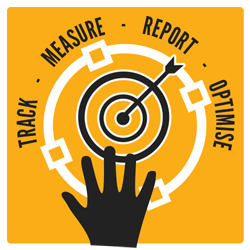 From creating UTM tags for your marketing activities, In-Page analytics, multivariate testing, to optimising for greater conversion, the Event Reporting Whitepaper complete with a complimentary Social Media Tracking tool and Report Template will ensure that your marketing activities are on track. MOBILE TECHNOLOGY: THE FASTER HORSE? Henry Ford famously said "If I had asked people what they wanted, they would have said faster horses", so he gave them the automobile. Technology has certainly advanced since then, with “mobile” at the forefront. We are just not as patient as we used to be, speed and ease of communication is paramount; so it’s not a surprise that mobile technology has had a vast impact on business and industry throughout the world. With all the changes in technology, one question comes to mind: Is mobile technology Henry’s faster horse that the events industry didn’t ask for? It may not be hands-free but at least the tablet has eliminated the need for hefty ring-binders and clipboards not to mention the improvement in efficiency and increased accuracy of information that paper-less registration has provided. It’s not just the clipboard that’s been trumped in terms of technology, but our good friend, the computer, is left behind where accessing information is concerned. Endurance event organisers and business event planners alike can rejoice at the advances in technology that have provided more sophisticated mobile event management apps and tools that can manage event and attendee data at a click. Yes, so life has improved for the organisers, but where are the attendees in this equation? Ease of access to event information, self-edits, agendas, speaker bios, schedules…all at attendee’s own convenience is a possibility through the use of handheld mobile devices. The increased interactivity provided for by mobile technology has been most advantageous for both event organisers and attendees. Attendees with real-time access to information can give their feedback through surveys and polls in addition to broadening their network thanks to applications that can match them to other possible contacts based on shared attributes. The transition to mobile has really boosted and extended the reach of events via social media channels such as Facebook and LinkedIn, enabling the creating of communities and encouraging engagement between organisers and their attendees all in a click. Is it a horse? No, it’s mobile. We may not have asked for it but it is here and it is definitely the way forward. For more information download the whitepaper on 5 Ways Mobile Technology Is Re-Shaping Events. I want MORE; doesn’t everyone? In a generation where technology is the driving force behind businesses and our day-to-day lives, the events industry has undergone a major facelift. Although there are no major adverse side effects to this facelift, attendees have come to expect and demand more from events…more choice, a better experience, more value, and more ways to connect. Ladies and gentlemen, raise your glasses to the 21st Century Event Planning. The simple days of sending out paper invites are no more, and so are many hours spent drowning in a sea of paper registration forms. Planning an event is now considered more of a journey, bringing people together with sustained community engagement throughout the event cycle. In a market where competition is rife, it’s imperative that event planners utilise technology to their advantage in building brand awareness and communities in order to drive greater conversion for their events. When was the last time that you used a pen and paper to manually fill out a form or hand-write a letter? Emails, text messages, Facebook, and Twitter have taken over. We live in a society where waiting a few days for information by post is just not acceptable, and in a similar respect, attendees expect the same, opting to receive information in real-time via email or enter registration information online at their own convenience. Although some organisers may be adverse to changes to their registration process, the move from offline to online can save valuable time, resources and money wasted on tedious administrative tasks. Do consumers still listen to the authoritative voice of the company CEO on brochures and websites anymore? Well, the answer is YES, they still do; however, attendees are becoming less susceptible to company-to-attendee communication as it’s viewed as advertising. In recent years PEER-TO-PEER recommendations have become extremely important in gaining and increasing brand loyalty as opposed to traditional advertising methods, so if you want more attendees, it’s vital that you use social media channels for lead generation and in increasing your conversion. Want more tips on how to achieve greater conversion for your events? Download the Guide to Drive Greater Conversion and start to increase your event ROI. When it comes to pricing strategy, one size does not fit all! Selecting the correct pricing strategy can have a vast impact on your revenue. Using our expertise and industry experience working with endurance event organisers, we have come up with the top 5 essential elements of creating event pricing strategies. Setting targets for your race registrations and revenue is extremely important. If you’ve organised a similar event in the past, you should aim for an average increase of 10% on your registrations. As mentioned previously, all events differ, and as such your pricing strategy should take these differences into account when setting your goals. Read our whitepaper on Event Pricing Strategies to aid with creating your event strategy. Although the World’s not going to end any time soon, it’s vital that you create a sense of urgency when it comes to your event registration. Having limited capacity and offering pricing incentives is a great way of enticing participants to register for your event early on and can eliminate their excuses or reasons not to register right away. Deciding when to open your online race registration shouldn’t be an afterthought. Depending on the type and size of your event, choosing the correct time to open your online registration could be vital to boosting your attendance figures and increasing your ROI. The Event Pricing Strategies whitepaper will help you determine when to open your event registration, whilst our ROI Calculator tool will help you put metrics and value to your financial outlay or investment. It’s not a game show, eliminate guesswork and don’t leave your pricing structure to chance. Like events, participants differ in opinion when it comes to fees and as such it’s virtually impossible to come up with a “right price”. A successful pricing strategy takes these differences into account and provides different pricing options to cater for those who are extremely price sensitive and the participants who don’t complain. Get help setting your price points with the Event Pricing Strategies whitepaper. Offering price breaks and their frequency will really depend on the type of event that you are organising and the targets and goals that you set out at the start. Some events may change prices on a monthly basis whereas others may only offer two or three changes throughout the registration period. Download the Event Pricing Strategies whitepaper and ROI Calculator to create a pricing strategy that will increase your attendance have a positive impact on your revenue. Developing social media presence is not an overnight affair! Simply setting up a Facebook, Twitter or LinkedIn account isn’t going to boost your conversion rates. Like any lasting relationship, the key to social media success is building trust, which takes time. When done correctly, social media can enhance your online presence and promote your organisation by increasing audience engagement with your content through “sharing” – the 21st Century “word of mouth”. 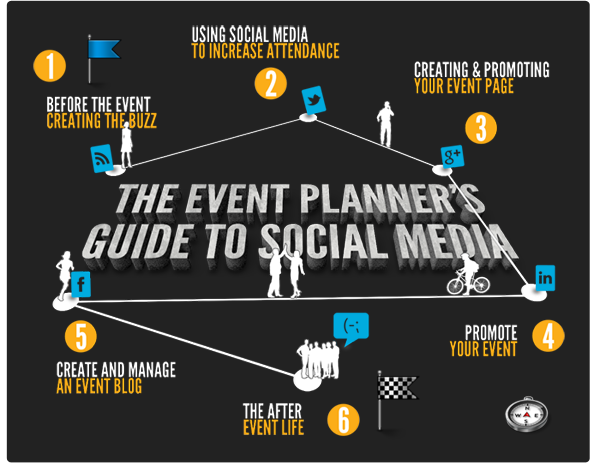 The Event Planner’s Guide to Social Media will help utilise your social media channels to create a buzz around your event, engage with your audience, increase event attendance, and gain valuable feedback after your event. Using aggressive marketing tactics to boost your conversions on social media channels can have negative results on your online presence. Social media relies heavily on content and quality interactions with your audience. Create content that your audience will find interesting and useful, something that they would want to share with others. Remember social media is not designed to be a one-way communication medium, so encourage discussions and comments to increase audience engagement. The Event Planner’s Guide to Social Media will provide you with best practices and tips on promoting your event via various social media channels. Unlike traditional marketing and advertising mediums, social media is one where sharing other people’s content is an acceptable, if not necessary, way of growing your community of followers. Commenting on other people’s blog posts will encourage others to engage with your posts and also help improve your online profile. Twitter is also another medium that encourages the sharing or re-Tweeting content, (if relevant to your audience). It’s all about content. Keep it fresh, interesting, and relevant. Although it’s important to be consistent with your blog entries and posts, it’s equally as important to ensure that your content is useful and relevant to your audience. Don’t feel under pressure to create content just for the sake of having something to post as followers will not want their social media feeds encumbered with irrelevant or repetitive information. Social media is the way forward. Innovate, inspire and share - download your copy of The Event Planner’s Guide to Social Media to help boost your online presence and event attendance. With all the various things that an event organiser has to do, it’s easy to overlook small things that could end up having a large impact on the success of an event. Searching the internet for tips and to-do lists for event organisers produces an array of materials; however, trawling through all the various documents for relevant information and best practices can be time consuming, encumbering and oftentimes prove fruitless. 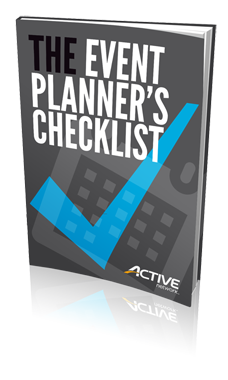 The Event Planner’s Checklist and Whitepaper provides a best practice guide and comprehensive checklist for pre-event, event day, and post-event activities. Choose your event location, invite your attendees, book your service providers, and complete your event…if only it was that simple! Event planning has come a long way from the 80s. Health and safety, local government requirements, permits, risk assessments, policies and procedures, are all a part of the pre-event planning process. In addition to fulfilling various local authority/government requirements, one must also take great care in selecting the event date and venue, as this could be paramount to the event’s success. Consider things like transport, parking, and road closures when selecting your location and ask your local tourist office or council about other events that are planned around the same date that could cause a conflict with your event thus reducing your attendance. Selecting sub-contractors, service providers and speakers is straight forward, but remember to secure their services in advance and provide deposits if needed to avoid disappointment. If hiring caterers, ensure that they have the appropriate licences and insurance. It’s a good idea to have an event agenda or production schedule prior to your event so that all you team and volunteers are aware of the running order of the event and key individuals that are responsible for each aspect of the event day. Whether you’re an event planning expert with a wealth of experience, or a novice starting to organise your first event, The Event Planner’s Checklist will guide you through all the various tasks that need to be undertaken before commencing your event marketing and registration process. Remember, the right marketing will ensure that you get the word out about your event, attract the right audience, and increase your conversion. Make sure that your event site content is current and that you’re utilising social media channels to cross-promote your event. Your event day has finally arrived and it’s all about COMMUNICATION! To ensure that your event runs smoothly, make sure that you brief all your staff and volunteers so that everyone knows what is happening and what to expect from the event. Encourage staff and participants to create a social media buzz around your event by tweeting and sharing content on social media channels. Not only will this enhance the participant experience, but it will also increase your profile and presence. Just because your event is over it doesn’t mean that your marketing efforts should cease. Post blogs, pictures, and video content from your event and rally up your attendees to share content in order to maintain the buzz around your event. Another aspect that is often overlooked after an event is the post-event survey. Gain feedback from your attendees in order to gage the success of your event and future areas for improvement. Remember to share data with your event sponsors and key stakeholders in order for them to put metrics on their financial involvement or expenditure. 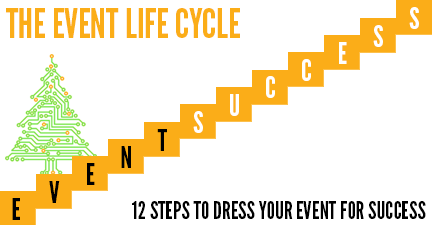 Simplify even the most complex event planning journey by taking things one step at a time. We have used our expertise to create a comprehensive step-by-step guide to help make sure that your event runs smoothly. Ensure that your event is a success and that it ticks all the boxes with the Event Planner’s Checklist. A lot has changed since the 90’s; the economic climate, technology, and society, to name a few. As a result of these changes, event planning has undergone a radical transformation. In order to account for these changes, we have compiled a guide intended to help serious event organisers take their event from the 90’s to the 2000’s with a few simple but effective techniques. Event Planning for the 21st Century – when did it become so complicated? The nineties was a good decade, a simple decade; you may have been drowning in a sea of event registration forms, but the event cycle was simple! Nowadays you need a team of marketing experts just to manage your twitter feed! The fact is, attendees now demand more from events, they want more choices, a better event experience, more value for money, and more ways to connect. Give your attendees more than they expect and simplify your event planning journey with ACTIVE Network’s A-Star Event Guide. There are many articles on the impact of technology on the evolution of event planning. The key to 21st century event planning is to stop thinking of a live event as the destination, and start thinking of it as a journey. No matter what the event, the aim of the journey remains the same: to bring people together with sustained community engagement throughout the event cycle. Engaging the right audience is paramount to the success of any event, and technology has given the event organiser ample tools to attract the right audience. Long gone are the days of sending out paper surveys after an event; Facebook, LinkedIn and Twitter have taken over! Social media monitoring or social listening is the new way of engaging with your participants before an event in addition to obtaining post-event feedback. Don’t get left behind, download your copy of the A-Star Event Guide and harness the power of social media to engage with the right audience for your event. There are many ways to track and monitor discussions about your events. Setting up Google Alerts for specific event names works well in tracking online comments and mentions. Online tools such as Hootsuite and TweetDeck also allow you to track specific hashtags or keywords associated with your event, making user engagement easier and less encumbering for the event planner. The PC may not be redundant, but the past decade has given consumers a variety of options when it comes to accessing information; and mobile is the way forward! The smartphone and tablet have become essential tools for the event attendee. For event organisers that are looking for more attendees, increased return on investment, as well as return on engagement; mobile offers the maximum in terms of audience reach, targeting, and real-time communication. 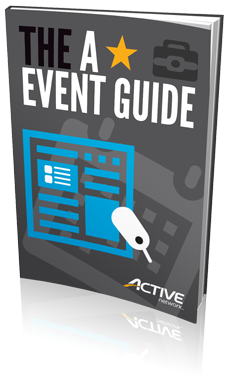 Get your event mobile ready in 9 simple steps with ACTIVE Network’s A-Star Event Guide. Organising your event registration and marketing for maximum effect is no walk in the park. There are so many aspects one must consider when executing each stage of the event planning journey that it’s easy to overlook a few things that could have a dramatic effect on the success of the event. Searching the web for articles and how-to guides to provide expert advice can be a tiresome affair. ACTIVE Network’s A-Star Event Guide combines all the tips and best practice techniques for the modern event planner to bring their event into the 21st Century. Providing a comprehensive step by step guide in increasing audience engagement and boosting event participation, it’s definitely the 2013 must have guide for event planners! The A-Star Event Guide will provide you with some top tips for creating outstanding events. From planning your event to promoting it, managing registrations and measuring your event success, it will help you get your event up and running in no time. People no longer read emails. They scan them. They also scan their inboxes and quickly filter through the emails that peak their interest and delete the ones that don’t. When it comes to promoting your event through email you have about a 3-5 second window in which to capture your registrant’s attention and get them to actually open your email. 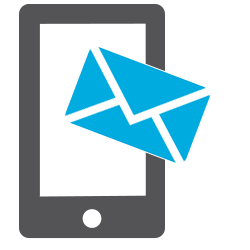 How your email appears in a recipient’s inbox can significantly affect your open rate so start with a good email template and try to get in the habit of optimising these 4 parts of your event emails to maximise your open rate. 64% of people say they open an email because of the subject line. (Source: Chadwick Martin Bailey) so it is important to spend some time on this critical part of your event email. 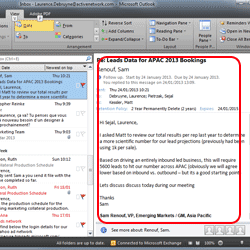 The two main jobs of your subject line are to accurately depict the contents of the email message and to entice your event audience to open it. With this is mind, your subject line should clearly and concisely communicate why someone would want to open your message. According to MarketingSherpa’s 2010 Email Marketing Benchmark Report, the top three types of subject lines that compel people to open emails contain a discount offer, a free product offer or a familiar brand name so when appropriate, include a discount or promotional offer for your event and the name of your event in the subject line of your emails. You may also be able to increase opens with a subject line that includes interesting stats, topical news, useful tips or a targeted question. Creating a sense of urgency or using automatic personalisation in your subject line can also increase opens, but only when used appropriately and sparingly. Whether you use a person’s name or your event name in the ‘from line’ of your email, the most important thing is that it is recognisable. Include your company, brand or event name if that is what will resonate with your audience, or send your emails from prominent individuals or spokespeople associated with your brand or event. Either way, try to use the same ‘from line’ for every event email you send to create consistency and generate recognition. Keep the ‘from line’ under 22 characters so it's easy to read across various email clients and devices. And never use a “do not reply” address as it discourages conversation. far more likely to open emails from senders they know and trust so be sure to also include your logo, company or event name in the preview space. Avoid having too many large images or headers in the preview as these will appear as blank space if the user has images turned off, or if they take too long to load, readers will move on. 4. Optimise the Email Snippet. One part of an email that is often overlooked is the snippet of the mailing. The snippet is displayed right after the subject line. It is pulled from the first part of your email and can be seen by Gmail, Outlook, iphone and ipad users before they actually open the email. If your email has a pre-header, a header or an image/logo at the top of the mailing this is what will show up as the snippet. Take advantage of this part of your email and ensure the text in this area builds on the content of your subject line to further entice your recipients to open the email. If the first part of your email is your company or event logo, ensure you include relevant alt tag text. The screen size of the recipients device will affect how much of the snippet they actually see so ensure you front load it with keywords if you can. Try optimising your ‘subject line’, ‘from line’, ‘preview content’ and ‘snippet’ in your next event email and see how it impacts the open rate. Let us know by commenting below. 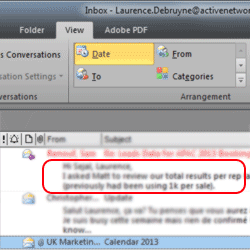 To help you improve the performance of your event emails even more, get the latest free professionally designed email template from the ACTIVE Network here. Social Media for Sports and Endurance Event Organisers Report: A Missed Opportunity? 84% of sports and endurance event organisers don’t measure the return on investment of their social media campaigns. That’s just one of the key findings in the new Social Media Report for Sport & Endurance Event Organisers published by Active Network today. Social media. These days it’s part of the fabric of our everyday lives. It’s also massively popular with sporting celebrities and mass media audiences. Who hasn’t used Twitter and Facebook to follow highlights from the Olympics to the Tour de France to Euro 2012? So you’d expect sports and endurance events to be enthusiastic users of social media to promote their events and drive participation. True? Well yes, but only up to a point. 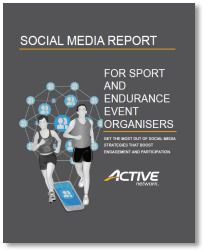 The new Social Media Report for Sport & Endurance Event Organisers published by Active Network today shows that sports and endurance event organisers are increasingly using social media heavy-hitters such as Facebook and Twitter to promote their events. But beyond these two channels, it’s a mixed story. Critically, 84% of the organisations surveyed don’t measure the return on their social media investment. In addition, many are missing out on the opportunities offered by complementary activities such as SEO optimisation and Pay Per Click (PPC) advertising. The good news is that many of the tools and software required to meet these goals are inexpensive or free. In addition, they are increasingly user friendly, so that digital marketers can quickly establish the value of their social media investment without needing to acquire specialist skills and training. The report also includes best practices for organisations running sporting events of all sizes. As well as describing how to create an engaging Facebook page and raise event awareness using Twitter, we’ve also outlined the best way to make the most of new channels such as Pinterest and suggested inexpensive and free monitoring and measurement tools. To get the full picture, and discover the opportunities to increase engagement and participation, download Social Media Report for Sport & Endurance Events Organisers today. If you have an official event website, you need to focus on Search Engine Optimisation (SEO). The goal is to get your website at the top of the search returns for keyword searches such as “Marathons in Singapore” or “Singapore Marathon”. With some small adjustments to your website, you can vastly improve your Google rankings. Just imagine all of the people out there searching for what you offer – they just don’t know about you yet! Efficiently collecting event participant data is only half the battle. Fully utilise your event management software and keep your registrants engaged all the way up to the day of the event with customised follow-up emails. The key to hosting a great event is to keep your participant’s excitement level rising steadily from date of registration to the day they show up to your event. If event registration opens 3, 4, or 5 months prior to the event date, expect that some registrants may get preoccupied at the office or with daily life and lose that feeling of exhilaration they experienced when signing up for the event. Keeping in contact with your participants on a regular basis will build anticipation and ensure they show up to the event ready to have a great time. Inviting the registrant to visit your event website for more event information. Announcements of new event merchandise for sale with a link to your online registration form for purchase. A final email including last minute updates to the event schedule and weather forecast. These are only a few examples of email content that has worked well for event organisers we partner with. Our best advice would be to get creative! Whether or not you are required to apply for a special events permit will depend on your community, town, or city law. If in doubt, we would suggest contacting your city council or local government so that they can inform you of any special requirements for holding an event in the area. Keep in mind that one of the biggest draws for your event will not only be the fun activities offered but also the level of organisation and focus on the well being of the event attendees. Is your event location in a safe area? Will children be safe if they stray away? Are you located near a street with heavy traffic? Can people who are not registered for your event mingle with your attendees? Addressing these and other safety issues will not only ensure your attendee’s security but also enable you to market your event as a safe occasion to be shared by all. More often than not, events will include some sort of food or refreshments for attendees. Two things you should consider are: Where will the food come from and how will I get an accurate count of how much food I will need? To address the first issue, you will need to decide if you will hire a catering company or purchase and serve the food yourself. The advantages to hiring a company are obviously that they will handle everything from purchasing the food, to cooking the food, to serving the food, and cleaning up after the event. The downside is the cost of course. If you have a good group of event volunteers, you may want to consider taking on the job yourself. The cost saved may be well worth the effort. The second issue of deciding how much food to buy can be the most difficult one. To get the most accurate count of food items needed for the event, make sure you include a section on your event registration form to collect the attendee’s food preference. The greatest challenge to hosting an event is finding a way to efficiently collect attendee payment and data. Ideally, you want to devise a procedure that is time efficient for your event staff and quick and easy for the attendee. In the past, event registration was offered exclusively on paper registration forms and probably went something like this: The attendee would fill out the paper form and mail it off to the event by post including a check. Once received by the event, a staff member would have to manually transfer the attendee’s personal information into a spreadsheet and make a trip to the bank to make a deposit. After a week or two of waiting, the attendee would get a letter back confirming his entry into the event. The main concern here is the length of time it takes your staff to process one entry and the time the attendee has to wait before receiving a confirmation. The result can be an overworked event staff and an attendee uncertain if his payment has been received. The growing trend in today’s events industry is the use of online registration software. You will want to find a software that offers complete automation of all the tasks normally required in hosting an event. Ideally your event management software should offer online credit card processing, easily customisable online registration forms, a secure database to house your attendee data, various data reporting options accessible from any internet connection, automatic confirmation emails sent to the attendee after making online payment, and an email marketing system that will enable you to keep in contact with your attendees and reach out to the them following year to invite them to your event. If you find a software that is right for your event, the resulting reduction of workload will allow your staff focus less on the mundane tasks and spend more time working on what is important – tending to your attendees!